The big hessian sack that contained the six pack of Hop Thief. The hints of leaking beer from the broken bottle is not visible. And by the way, it wasn’t like they mailed it in the sack – the whole thing arrived inside a box. Because I write a weekly beer column for my newspaper from time to time, I’ll get a parcel arrive on my desk that contains beer. Yes, it is the best sort of mail you can get. Just wish I got it more often (how do I define ‘‘more often’’? I define it as ‘‘every day’’. Is a daily delivery of beer too much to ask?). Sometimes the delivery is of a single bottle which is great, because it’s free beer. But also not great because it’s only one bottle. For me, two review bottles works better – and here’s why. The first bottle is the one I drink and take notes on, the one I pay deep attention to and think about while I’m drinking it. It’s the one that feels a bit like work. Yeah, I hate taking notes while drinking beer. It’s not uncommon for me to open the fridge and be disappointed that all the beers I see are ones I plan to review – either for the newspaper or this blog. Sometimes I just want to drink a damn glass of beer without a pen in my other hand. Does that make me less of a beer geek? Don’t care. So, the second bottle. That’s the one I can crack open and enjoy for the sheer goddamn pleasure of it. And do so without having to come up with descriptors for malt flavours other than ‘‘malty’’. But some people go above and beyond and send me a whole goddamn six-pack. I’m talking about people like James Squire – or their publicity company, whoever decides the volume of beer to send out. So a week or so ago I got a whole six-pack of the JS newie Hop Thief 6. Well, actually it was a five-pack – one of the bottles ended up getting smashed in transit, despite each individual beer AND the six-pack itself being absolutely coated in bubble wrap. Australia Post must have chucked the package up against a wall. Several times. Anyway, five beers is still nothing to be sneezed at (neither is the bottle opener they came with. I might glue a few magnets to it so I can attach it to the fridge for easy opening). And they’re good beers too. I’d previously nominated The Constable as my favourite from the James Squire range but now I’m forced to revise that. Because the Hop Thief 6 is – in this blogger’s opinion – the best beer in the Squire range. And it’s now part of the bottled range too. 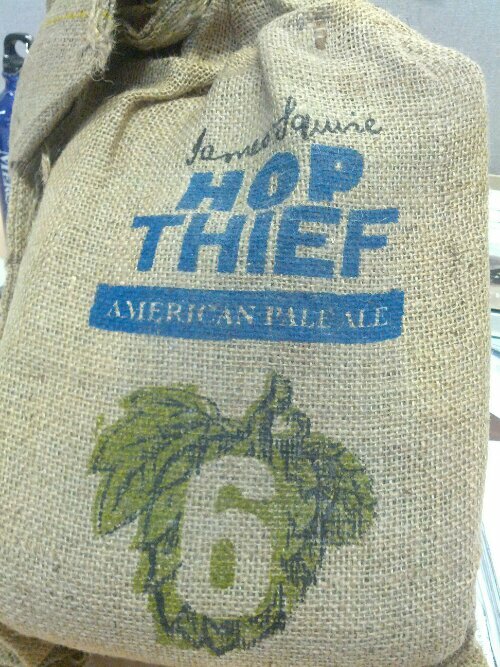 After the first five iterations of Hop Thief being tap only, they’re now putting it in bottles which means people like me who don’t live near a James Squire pub can try Hop Thief regularly. The Hop Thief is a seasonal beer whose recipe gets changed to include different hops (hence the number after the name). This time around the hops are Simcoe and Columbus, which give not overwhelming but definitely there flavours of passionfruit and piney resin. Before the hop characters kick in there is some toffee-caramel flavours and then the whole thing ends with a nice, clean bitterness. And the bonus is, I have four more to drink. And a bottle opener with which to pry off the caps. As Charlie Sheen would say, winning. I can relate to what you are saying about looking in the refrigerator for a beer you had not planned to review. It is a bit of work, but I’d be hard pressed to think of a better form of work.